Photograph captioned: "Easter Week at Univ. of Va. / Lambda Pi Sounds off," ca. 1930. 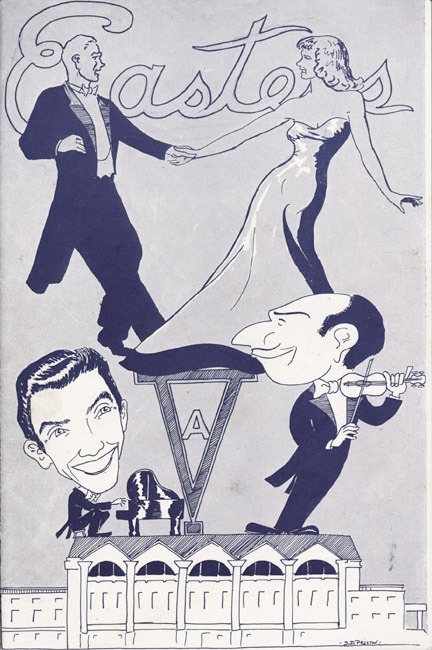 Easters concert given by Xavier Cugat and his orchestra in the McIntire Amphitheater, photo by Ralph Thompson, 1948. Easters in "Mad Bowl," photo by Jon Golden, 11 April 1976. 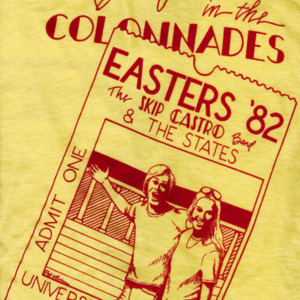 The final Easters T-shirt, 1982. Gift of Robert T. Canevari. 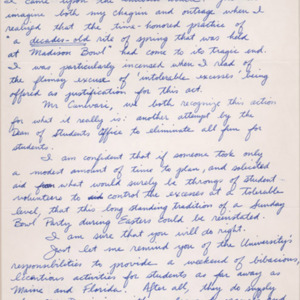 Autograph letter, signed, from James C. "Jim" Tyrone ('77), to Dean of Students Robert T. Canevari, 11 April 1979. Excerpt from Frances Parkinson Keyes, All Flags Flying: Reminiscences of Frances Parkinson Keyes. New York: McGraw Hill, 1972. As early as 1898, University students celebrated Easter Week or "Easters." This week-long diversion included elaborate dances and athletic games which helped the students shake the winter doldrums. It was also an occasion to celebrate Thomas Jefferson's birthday as it often fell near April 13. 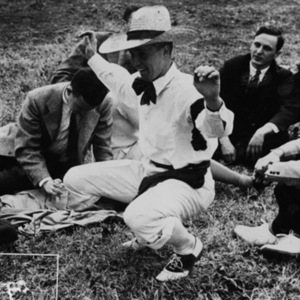 In the early days, the Easter week dances were chaperoned by faculty wives and "pledged"--meaning no student could imbibe an alcoholic beverage after noon of the day of the party without violating the honor code. Though Easters had grown tremendously in scale by the 1950s, students were, for the most part, still commended on their gentlemanly behavior. 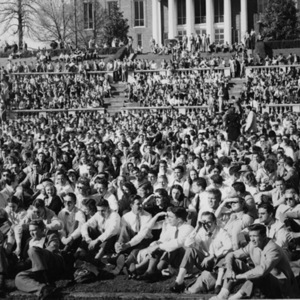 Easters continued to expand over the years, however, until thousands of students on the East Coast were making the pilgrimage to Charlottesville to celebrate what came to be known nationally as the "Best Party in the Country"--to the dismay of University administrators. With the increasing use and abuse of alcohol by students and the influx of "outsiders"--visiting students and townspeople--administrators became concerned about the University's reputation and its students' welfare. The mud slides and massive weekend parties in Madison Bowl were discontinued following the 1976 Easters. 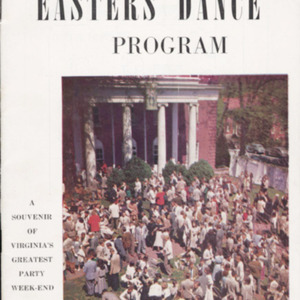 The last Easters at the University of Virginia was celebrated in the spring of 1982. 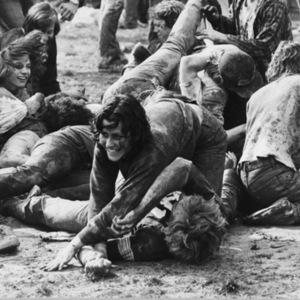 In response to the end of the "Mad Bowl" parties, one angry alum wrote in his letter (shown, lower left) to Dean of Students Robert Canevari: "You can imagine both my chagrin and outrage when I realized that the time-honored practice of 'a decades-old rite of spring that was held at Madison Bowl' had come to a tragic end. . . .Mr. Canevari, we both recognize this action for what it really is: another attempt by the Dean of Students Office to eliminate all fun for students." 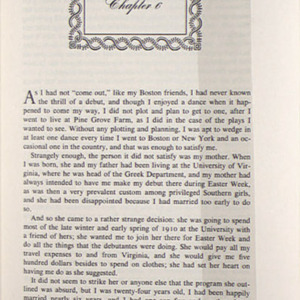 Another memory of the Easters traditions comes from Frances Parkinson Keyes, who writes in her memoir (excerpt shown, lower right): "When I was born, [my mother] and my father had been living at the University of Virginia, where he was the head of the Greek department, and my mother had always intended to have me make my debut there during Easter Week, as was then a very prevalent custom among privileged Southern girls . . . It did not seem to strike her or anyone else that the program she outlined was absurd, but I was twenty-four years old, I had been happily married nearly six years, and I had one son five and another three."